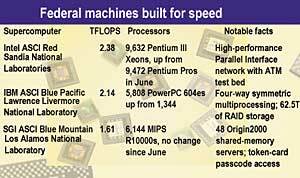 Federally owned or funded supercomputers this month took eight of the top 10 positions on the latest list of the world's 500 fastest supercomputers, as ranked semiannually by academic researchers. The eight megamachines are at the Energy Department, Navy facilities and two classified locations. Three massively parallel supercomputers built to simulate the aging of nuclear weapons under Energy's Accelerated Strategic Computing Initiative took the first three slots among the top 500. All three have passed the threshold of 1 trillion floating-point operations per second. According to the Linpack linear-algebra benchmark, the Intel ASCI Red supercomputer at Sandia National Laboratories in Albuquerque, N.M., edged out the IBM ASCI Blue Pacific at Lawrence Livermore National Laboratory in Livermore, Calif. ASCI Red clocked 2.38 TFLOPS, and Blue Pacific hit 2.14 TFLOPS. Blue Pacific's theoretical peak speed of 3.9 TFLOPS exceeded Red's rating of 3.2 TFLOPS, however. Los Alamos National Laboratory in Los Alamos, N.M., has two of the top 10: the third-ranked SGI ASCI Blue Mountain and No. 7, an SGI Origin2000. They are benchmarked at 1.6 TFLOPS and 0.69 TFLOPS, respectively. Debuting on the list at No. 120 is the ASCI White prototype, an IBM machine that will have a theoretical peak speed of 10 TFLOPS when fully assembled. The only government machine among the top 500 not credited to a particular maker is No. 265, Los Alamos' Avalon, a homegrown Linux cluster. The list, compiled by the Uni-versity of Tennessee at Knoxville and Mannheim University in Germany, is at www.top500.org.